Sam" The entire Road Trail Run crew tested the Naked and absolutely loved it for urban, trail, and everything in between running. Everyone wanted to chime in, in detail, about this fantastic product. 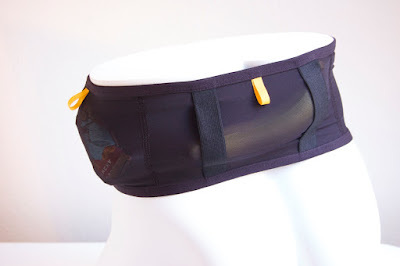 It is a stretch mesh band with drop in pockets all around which is a simple and effective method of carrying a variety run or cycle essentials from water to phones to even jackets, all secure and very easily accessible at any pace. It is also a great option for travel to hide passports, cash, etc..under a shirt. Far and away the best running belt any of us have tried and we have tried just about everything over the years. It is far easier to quickly retrieve and return items with the Naked than with FlipBelt type fabric belts or bottle belts and compared to those other options there is less, or in fact almost never any bounce, no matter the load. Jeff, Peter and I highly recommend it! Peter: Billed as a lightweight, bounce-resistant, non-chafing belt to carry gear on the run, how does the Naked Running Band live up to those claims? I like to run with as little gear as possible. A big part of the joy of running for me is the freedom of a sport with so little gear to carry. Shoes, singlet, shorts—maybe some socks—and that’s it! Unfortunately, life has gotten more complicated, so I now have to have my phone with me on long runs (baby due any day, like to have music), and on long runs I like to carry some liquid calories as well as some gels. On some days, the weather is inconsistent, so there might be a rain shell. You get the point—this stuff starts to add up and suddenly I’m carrying a bunch of crap around. So what to do? I’ve tried many different vests, and some of them have been pretty good. My favorite vest to this point has been the Orange Mud Hydraquiver. It’s good, has room for some extra stuff, the bottles are easily accessible and it doesn’t bounce. Unfortunately, when it’s 90+ degrees out, It’s also a large area of my back covered in extra material and it gets hot. Other vests have been chafe and bounce fests. I hate belts. Every belt I’ve had has been a chafing, jiggling, bouncing mess. And now, along comes the Naked Running Band. The Naked Running Band is a simple mesh belt that you step through to put on. It weighs 2.3 ounces and lists a carry capacity of 2.5+ liters. There are no closures or clasps—thus cutting down on potential chafing spots. You have to get the size right, but once you do this thing hugs your hips and disappears. There are a lot of great little features that make this a terrific product. Made of 4 Way Power mesh the belt is essentially made two layers of mesh. They are connected completely at the bottom and open to four pockets on top for complete wrap around storage. Each ‘pocket’ has a yellow pull tab, so it’s easy to open up and drop gear in or pull it out on the run. The bottom and top edges are doubled making it easy to find the openings when for example rapidly reaching for a gel. The double fabric also makes the closure secure. It’s light, quick drying and seems to be holding up fine to repeated runs with lots of stuff in the pockets. The band comes in 6 sizes (in June it will come in 12 sizes). Step through, pull it up to the hips and it should hang there without a problem. In my experience, there’s virtually no bounce and absolutely no slippage. I ran a marathon this weekend with a phone, three gels and a 16 oz soft flask and never even noticed the band. I would hope that it retains tight fit over time, and, so far-so good. Pull tabs: There are bright pull tabs on each pocket section which allow a quick, no look grab of whatever you need from the pocket. When you let go the pocket snaps closed. Super easy. Key clip: One of the pockets features a locking key clip. Easy enough to make sure your car or house key stays put run after run. Great way to stash a jacket or shirt off the back of the belt if you need to. Also apparently good for trekking poles. The loops have silicone to keep things from slipping. Versatility: One of the best things about this belt is that it can hold lots of different things. The front and rear pockets are a bit bigger than the side pockets. Any phone (with or without case) should easily fit in a front or rear pocket. Soft-flasks are no problem, small water bottles fit easily. There’s room for plenty of gels, some gloves, headphones, etc. I’m primarily a road runner, so I don’t have too much other stuff to bring. Sam: I have carried two Salomon 500ml (17oz) soft flasks, an iPhone 7, keys a windbreaker, and a few gels with no issues of bounce and complete if snug comfort as I am just between sizes. A change in the design for June will make it a 3 vs.4 pocket design. Naked tells us this will allow more easily carrying up to 3 soft flasks. A higher capacity model is coming soon. 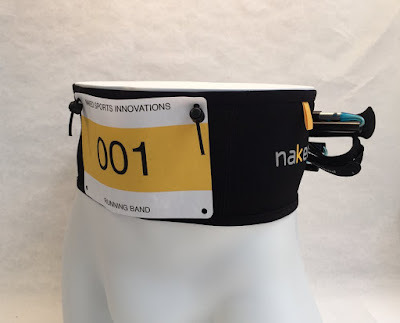 The front of the Naked Running Belt has two strings with spring clasps to attach a race-bib. It’s a good way to keep from putting a race number on your shirt with safety pins. Nice touch. Peter: I’m a big fan of the Naked Running Belt. I like to carry what I need without having to feel like I’m carrying anything. The Naked Running Belt disappears around my waist and I have easy access to everything I need for a long run or even a marathon. It’s an elegant solution and I’d highly recommend it. My only knock on the belt is that it works best with your shirt tucked into the belt—which isn’t always the best look. Sure, you could wear your shirt over it, but that would cut into the utility of the belt. It’s a minor issue really—and if you’re looking to carry some gear without bouncing, chafing or heating up your back—the Naked Running Belt is a terrific buy. Sam: With a simple effective design, the Naked Running Belt is the most versatile, no bounce, high capacity belt I have ever used. After fussing with pockets in shorts, hard to find openings of fabric style belts and finger twisting retrievals, the hard to reach zippers of others, the sometimes awkward snap in bottle belts everything is easy to reach and return nice and secure with the Naked Running Belt. The Naked Running Band, after a day or two of testing, quickly became a can't live without staple in my running gear bag. I trail run exclusively and my typical daily runs involve at least 2,300 of elevation gain at altitudes ranging from ~5,300 feet to 8,500 feet, where much of the year it is likely that I'll carry a combination of a light wind shell, gloves, beanie, gels, car key, water and iPhone. At the very least, I always have my phone because I have little kids and need to be on daddy call, use my phone as a camera, gps, mp3 player, etc... Not to mention, I don't really care to take the chance leaving it in my car at a trailhead. Previously, I have often been able to stuff many of my smaller essentials in various pockets depending on the clothing I am wearing and tie a windbreaker around my waist, but safe and secure phone carrying solutions have been limited, but my preferred methods have typically been either the Pearlizumi Ultra shorts/tights (no longer available), or a running vest which is often overkill for most of my shorter daily 60 to 90 minute runs. I used to prefer the convenience of putting the phone in my shorts/tights rear pocket, but a recent mishap on a steep and icy trail resulting in a cracked screen has had me rethinking the rear phone storage idea. Enter the Naked Running Band. Since I have received it a month ago, I have worn it on just about every run. My waist is 32 inches, so being on the upper end of the suggested 31-32" for the size IV, I went with the next size up, the 33-34" size V just to be on the safe side. I feel as though I had made the right choice, as the size V fits me perfect. When loaded with the essentials that I need, unlike the majority of waist belts I have used in the past, the Naked Band, when sized properly, does not shift, creep up, slide down or rotate. I feel no bounce whatsoever and do not even notice it is there. I can easily fit my phone in any of the pockets and sometimes use it exclusively for that, but then frequently secure my car key to the clip inside the right hip pocket, add a windbreaker, gels, hat, gloves and occasionally a 500ml flask. One note if carrying a bottle or flask, the increasingly common soft bite valves will leak and even spray water when the bottle is compressed inside the pocket, so a more traditional secure valve is preferable. If using the flexi bite valve, I have found that when the bottle is full, I can angle the valve up and out of the pocket to reduce the chances of leakage and as the bottle empties, chance for leakage reduces. As far as how to wear it, I have tried a variety of methods, but most often I choose to position the band such that the hem of my shorts lines up in about the center of the band, performing double duty as a belt to keep my shorts in place. The top half of the band typically lies comfortably upon my skin just below my naval with my shirt draping over the band. With just shorts and a single layer shirt, I find this method to work best for me (although when the band is full and the shirt drapes over, there is a bit of a muffin top look). If I put the band over my shirt or shirts, I find that it can affect how my shirt lays on my shoulders and moves with my body as I run. This will mostly be dependent though on preference, clothing materials and layering techniques. Access to the pockets is easy as can be with a yellow pull tab on each of the 4 pockets, so I can quickly get in/out of the pockets while running at just about any speed on any terrain. As mentioned above, I run a lot of vertical, typically straight up a steep mountain, then straight back down. I love that I can rotate the band for optimal comfort to cater to gradient. For example, on a steep uphill when I am leaned forward climbing, I prefer to have either nothing or something soft in front as to not feel a hard object there compressed against my stomach, so I keep my phone in the back. When running downhill, when the risk of a fall is increased and with higher consequence, I simply rotate the band 180 degrees to position the phone in the front, where it would be less likely to be impacted in a fall. The external loops on the back can accommodate a rolled up jacket if you are really pressed for space, but in most circumstances, I just find it preferable to jam it in one of the 4 pockets and not waste the time or concentration rolling, folding and positioning. I tried securing a set of folding poles in the loops solely for the purpose of this review and found that I could put one in there without too much trouble, but securing a set of even the lightest, slimmest running poles seems to be more trouble than it would be worth in my opinion. If I anticipated the need to carry poles prior to a run, I would just move up to a running vest with dedicated pole loops. Over the test period, I have not noticed any stretch or degradation and quality really appears to be top notch. I'll for sure be using the Naked Running Band for my summer races to carry a small bottle or flask, a few gels and am eager to have the convenience of using the race number holder and no longer have to pin on a number, or debate which article of clothing to put the number on (especially helpful in mountain races where layers may need to be added or changed). 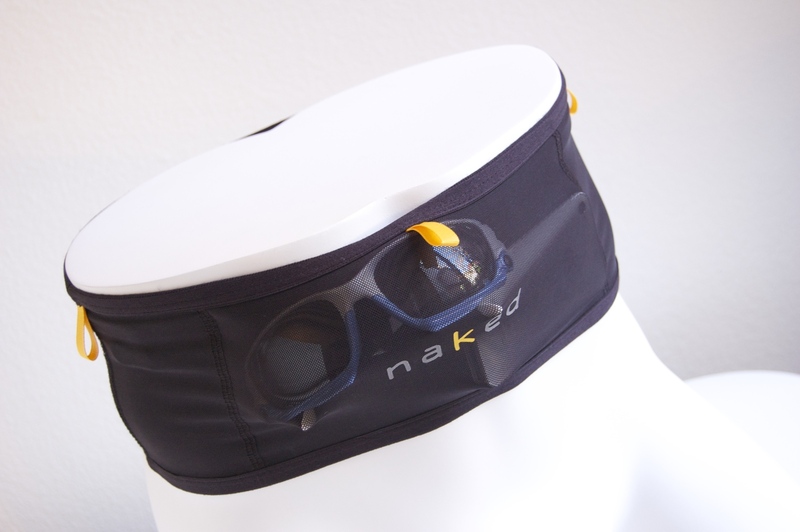 Other uses: I have also found the Naked Running Band to work extremely well for cycling. When riding, I often fill my 3 jersey pockets with essentials that I'll be accessing while riding, windbreaker, food, arm warmers, etc..., but also need to work into that mix my wallet, iPhone and sometimes a car key. This space gets maxed out fast and I worry about losing valuables when pulling out a jacket or a gel. With the band, I comfortably store my phone, wallet, key and if on longer rides, a bit of added food. This is a huge benefit, keeping valuable items secure, organized and freeing up valuable space in my jersey pockets. I really can't come up with a single complaint for the Naked Running Band, but I think some might appreciate a wider range of sizes, especially larger runners, as the size cutoff is 35-36". A choice of colors could be fun too, but I am very happy with the black. The Naked Running Band was provided at no charge. The opinions herein are entirely the authors'. Click Here for Latest Running Shoe and Gear Reviews, over 65 2018! Thank you for the most thoroughly tested and expertly reviewed report on our running band than ever before! One note about the jacket / pole loops. As you have mentioned our newest version being released in June comes in 12 sizes and a host of new improvements. In particular, as we have elite runners racing in Europe whereby carrying poles becomes almost a necessity we wanted to be sure poles fit without a fight. I am am happy to report that our new band easily fits securely a pair of poles. Even slightly thicker ones like the BD Z poles are comfortably secure in the running bands rear loops. Thanks for the update Lindsay and thanks for the opportunity to test the NRB. I have already been raving about your product to everyone I come across and sending them your way, this is a must have for runners and cyclists (if you have not done so already, you should consider marketing to the cycling crowd and perhaps make a softer more smoothed out travel band?). Like I said in the review, I use the NRB on most runs, but I'll certainly not take another bike ride without it, awesome solution to my long standing where to safely store phone/wallet/key dilemma. Honored to be included in your awesome site. Do you have a good soft flask recommendation for the Naked Belt? I would rather get something that I don't have to worry about leaking. Also, it seems the Naked site still has the old model for sale (still only 6 sizes). Are the 12 sizes coming soon? Does it have the new band now? Thanks for the great review(s). Love the thorough analysis! I have a message into Naked about the sizes and larger models and will post here when I hear. Thanks for the extremely quick reply. I love the reviews here. I just got into running this spring and this site has been super helpful. The main problem now is deciding which shoes and gear to buy, as there seems to be a bunch of really nice stuff. Hi Ben, Thanks so much for reading. Any questions about all the fine stuff please write. and please also tell your run friends about RTR. Thanks! With some finesse, I can angle a soft flask to not leak, but more often than not, I have a flub and lose some water whether I am getting set up/adjust to go, tying my shoes or working it on technical terrain. I have just given up and use a smaller, flat-ish small handheld bottle (~10 oz.) with a normal non bite valve. They are small, but if I am adding bottles to the NRB, it means I am not going to be out for too long and need much (if hot or going longer, I'll transition to a vest for more water carrying capacity). Also, my NRB is starting to sag when I add weight, perhaps from stretch and/or a few pulled seams, so more and more I try to keep it light. The owner did say they were working on the stitching quality in the next (current?) version. I contacted NRB today and they said that the new models are in but they haven't updated the site yet. Apparently if you order one now you will get the 3 pocket version. Anyone tried v2? Comments on the new model would be great.